Edtech entreprenuers, teachers, and administrators all need one another. Sometimes, however, we are not speaking the same language even though we are all trying to be a part of the same conversation. 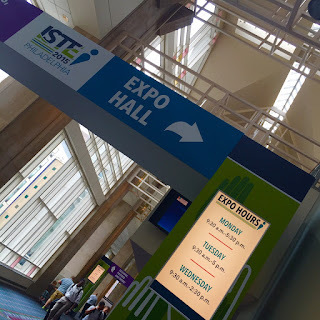 After attending both an EdSurge Summit and ISTE within the past three weeks, I've had the chance to meet with many enthusiastic programmers and designers. Some are doing a better job than others at connecting with their allies on the ground -- the teachers. The ones that are doing it well are using these tactics during those precious few minutes they have a chance to interact with an educator. 1. Have a quick 2 sentence passion statement ready. The good news is that if an educator has made her way to your booth, she is already interested in what you have to offer. Start by clearly defining your mission and how your product accomplishes it. Do it in 2 sentences. No more. At this stage, all you want is for the teacher to have a clear understanding of the pain points you are trying to target. expo at ISTE in Philadelphia this week. This shot of the entrance will have to suffice. 2. Find out what drives teachers. Educators love people. They become educators because they love working with children. They go to conferences because they love to talk with other educators about what works. They will like the tools you have created as long as the tool fosters those relationships. Beyond that, each teacher has a passion for his content and the age group that he works with every day. Ask him about that content and why he loves it. Ask him about why he loves his students. The better you know the teacher as a person, the more personalized and effective your approach can be. 3. Let them play and watch what happens. As you show the educator how your product can transform teaching and learning, make sure the educator is the one interacting with the tool. Her fingers will be moving on the tablet screen, the track pad, or pushing the keyboard buttons. You can be a guide, but let her experience the tool. She will become comfortable with your product and you will learn how she naturally navigates through it. Her comfort will create a higher likelihood of actual adoption when she goes back to school. 4. When they give suggestions, listen. Can I embed a video that students will stream directly on the platform? Will parents be able to view their child's work within the tool? Can students respond to comments I leave on their work so that we can continue the conversation? These questions give you insight into how teachers interact with their students and therefore how your tool can be improved to facilitate those interactions. If a teacher asks about or suggests adding a feature, don't shoot it down. Listen to the reasons behind his suggestion and consider his perspective as you move forward with your product. What about the role of administrators in the discussion? Don't worry. I certainly haven't forgotten the important role of administrators. Once teachers have had a chance to try the tool and hear your passion, they will know whether it is a good fit. This is when the conversation with administrators can get down to numbers. I do realize that often the conversation starts and ends with administrators, but teachers need to be involved as well. If they aren't, the tool will not be adopted as successfully. These guiding questions will help everyone come out happy in the end.